Someone Opened a Credit Card in My Name! One of the scariest – and perhaps infuriating – moments is learning that someone has opened a credit card – or several credit cards – in your name, maxed them out, and left your credit history in shambles. Unfortunately, many people don’t learn about fraudulent accounts until they try to apply for a credit card or loan and are denied because of a past due balance for an account they didn't know they had. If you learn that someone has opened a credit card in your name without your permission, take these steps to clear up the account and your credit history. Find out the name of the credit card issuer for the unauthorized account. Contact their fraud department to have the account closed. You can find the correct contact information on the credit card issuer's website. Don't return a phone call to a number on your voice mail or one you received via email - one of those numbers could belong to a scammer. When you've contacted the credit card issuer, let them know the account is not yours. The credit card issuer may ask for further proof of the fraud, like a police report or identity theft affidavit. 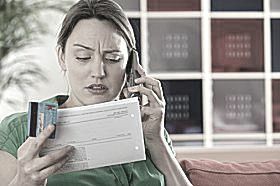 Beware of any phone call you receive from your credit card issuer's "fraud department." This could be a scammer who's trying to get you to give up personal information they can use to commit fraud. You aren't responsible for any unauthorized charges. If someone opens a credit card in your name without your permission, you’re not responsible for charges made on that card. But, you have to take action to be sure you're not held liable. Report the fraud in a timely manner and provide any proof the credit card issuer requests. There may be more than one fraudulently opened accounts that you don’t know about. Check your credit reports at all three of the major credit bureaus - Equifax, Experian, and TransUnion - check for any other accounts that may have been opened in your name. You don't have to pay for a credit report if you're looking for instances of fraud. You’re automatically entitled to a free copy of your credit report if you’ve been a victim of identity theft. The ID Theft Affidavit form is voluntary, but can help you get fraudulent accounts removed from your credit report quicker. You’ll also need the form if you decide to place an extended fraud alert on your credit report (a seven-year fraud alert vs. the 90-day initial fraud alert). You can provide the ID Theft affidavit to your local police to assist with their police report. If you know who opened these accounts, you can have that person prosecuted. Even if you can’t confirm who opened up the fraudulent account, you should still file a police report. The police report will be critical in getting the accounts closed and removed from your credit report. Send a copy of your police report and ID Theft affidavit to the bureaus as proof that the fraudulent accounts aren’t yours. Without these documents, the credit bureaus may not remove the fraudulent accounts from your credit report even though they aren't actually yours. Confirm the fraudulent accounts have been removed from your credit report. The credit bureaus are supposed to send a free credit report automatically any time your credit report dispute results in a change to your credit report. Once you receive your credit report, review it again to make sure the fraudulent accounts have been removed. Repeat the dispute process if the accounts haven’t been removed from your credit report. You’re allowed to file a lawsuit against a credit bureau that fails to remove inaccurately reported information from your credit report. In July 2013, Equifax lost an $18.6 million lawsuit for failing to remove inaccurate information from a woman’s credit report despite her eight disputes. You can add a fraud alert or security freeze to your credit report to protect your credit from future attacks. The fraud alert informs anyone who checks your credit report that they should take further steps to confirm that you’re the one applying for credit. It’s then up to the business to make sure the person applying for credit is actually you. With a security freeze, your credit report is locked and the business can’t check it at all unless you unlock it first. Continually monitoring your credit – by ordering your free credit reports through AnnualCreditReport.com – is essential to catching and clearing up instances of identity theft before they create inconveniences like preventing you from buying a new house or car.